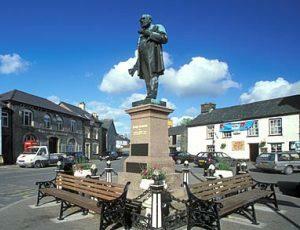 Tregaron to Llanddewi Brefi Walk at Tregaron01970 612125workWalking Route1. Turn right off the B4343 onto the tiny lane leading to Bronmwyn (roughly 6.5km north of Tregaron on B4343) and through the farmyard, bearing left at the stables, then right to ford a stream. Continue through two gateways as the track winds gently uphill. 2. Where the track bends left on a slight summit, leave it and follow a dry stone wall heading to the right, over reedy grass towards a large lone tree. From the tree, head beside the dry stone wall on the left to gain a rough path running roughly alongside a stream on the right. The path crosses the stream twice early on (poles advisable). Continue on a decreasingly distinct path near a wire fence, and ford a tributary stream coming in from the left. 3. Cross this and continue in the same direction to follow the contour with the hilltop to your left before dropping to a stile in a boggy corner, close to a pile of stones. Bear half right to cross the next narrow field to another stile and cross this. 5. Cross the grassy field and go through the leftmost of a couple of gates on the far side. Head down a grassy track which becomes increasingly muddy near the farmyard. 6. Just before the farmyard turn left onto a wide track. Go through ametal gate, and turn right to follow the fence line round and down to the far right corner of the field. Continue following this right as it becomes a beech-lined track way. The path narrows as it bends left to descend to a rickety metal gate. fence line on the left until the track reappears. Continue on this, very boggy in places, and cross a third stream to exit through a gate by a barn undergoing renovation to reach the start of tarmac. 9. Exit left onto a road into Llanddewi Brefi, where you could take a look around the Church and graveyard, pop into the village shop or grab a quick drink in one of the pubs before catching your bus, or returning via the same route to Tregaron. Terrain: Mostly defined tracks with some rough undefined sections. Very boggy in places. Fairly long road walk at end. Suitable for: Moderately fit walkers. Energetic children. Dogs on lead around livestock. Tregaron and onto Aberystwyth. Also local taxi company. 1. Turn right off the B4343 onto the tiny lane leading to Bronmwyn (roughly 6.5km north of Tregaron on B4343) and through the farmyard, bearing left at the stables, then right to ford a stream. Continue through two gateways as the track winds gently uphill.